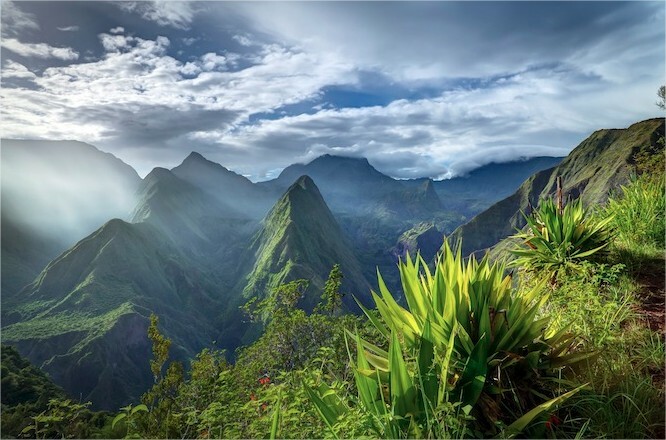 Overseas department since 1946 located about tens of thousands of kilometers from France, Reunion Island is a holiday destination of choice, especially for nature lovers. Mingling island exoticism, luxury hotels, security and many facilities for tourism, Reunion Island promises a total change of scenery of the old continent. Reunion Island is known around the world for its rich and diverse heritage sites and fascinating cultural mix. 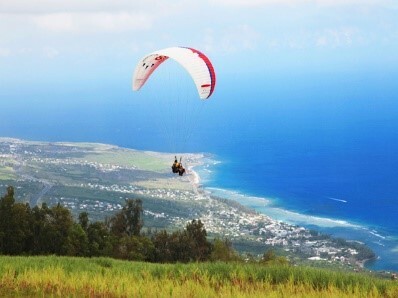 Whether for the beach or exotic green landscapes; Reunion Island offers thrilling experiences, breathtaking hikes, total relaxation, tasty Creole cuisine, regular festivals and cultural events, and a tropical lifestyle shared by locals and visitors alike. Its 800,000 inhabitants have varied origins. At different times the island has welcomed people from a dozen countries and three major continents. Formerly a port of call in the Indian Ocean; its history has been shaped by travelers from Africa, Madagascar, Europe and Asia who have settled on the island. You will understand that the island of Reunion carries its name extremely well. The island can be described as a crucible whose residents are proud of. No matter where you go on the island, locals pay a lot of attention to their cultural values, something great for those wishing to discover the varied creole cuisine. We find this beautiful mix also in other events such as colorful festivals and music of the island. Cultivation of sugarcane has been the most important economic and cultural pillar of the island over the centuries. 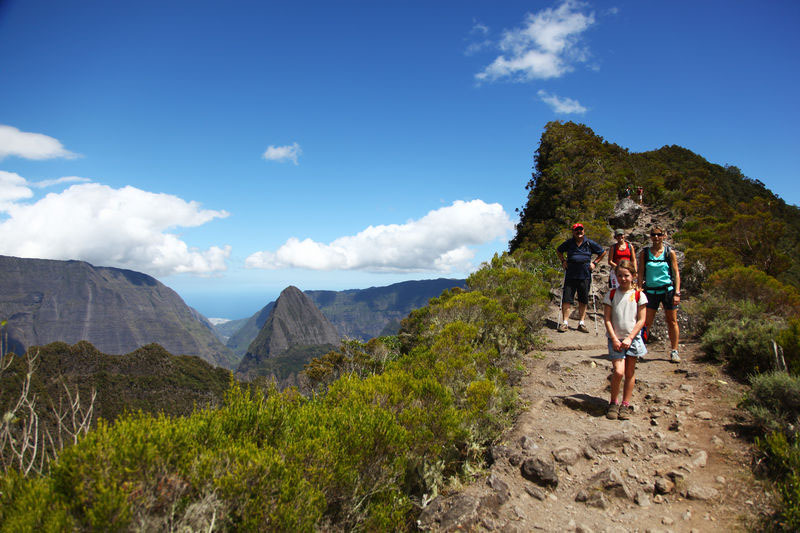 For some years, the Reunion Island Tourism organization has worked in partnership with tourism professionals to identify a collection of value-added cultural tourism experiences. These experiences will help you live life as a resident of Reunion Island. Visit the website https://en.reunion.fr/for all activities and tourism facilities on the island. 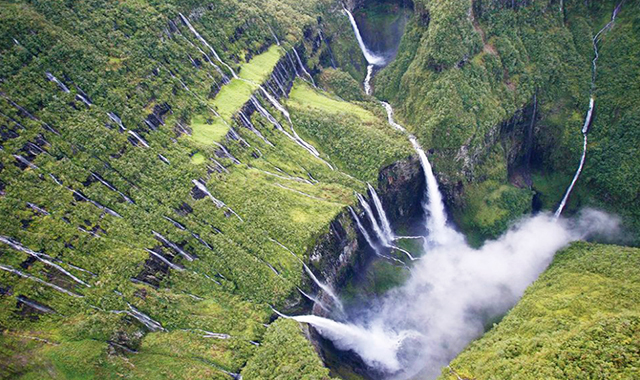 As you will see, hiking and waterfalls are popular on the island of Reunion. Here are the most beautiful places to walk and discover waterfalls in nature. Reunion offers an exceptional playground for mountain lovers and adventurers. This small island, with an area of 2500 km², is crossed by more than 900 km of marked trails for hikers of all ages. These courses run through a very diverse environment of breathtaking beauty. 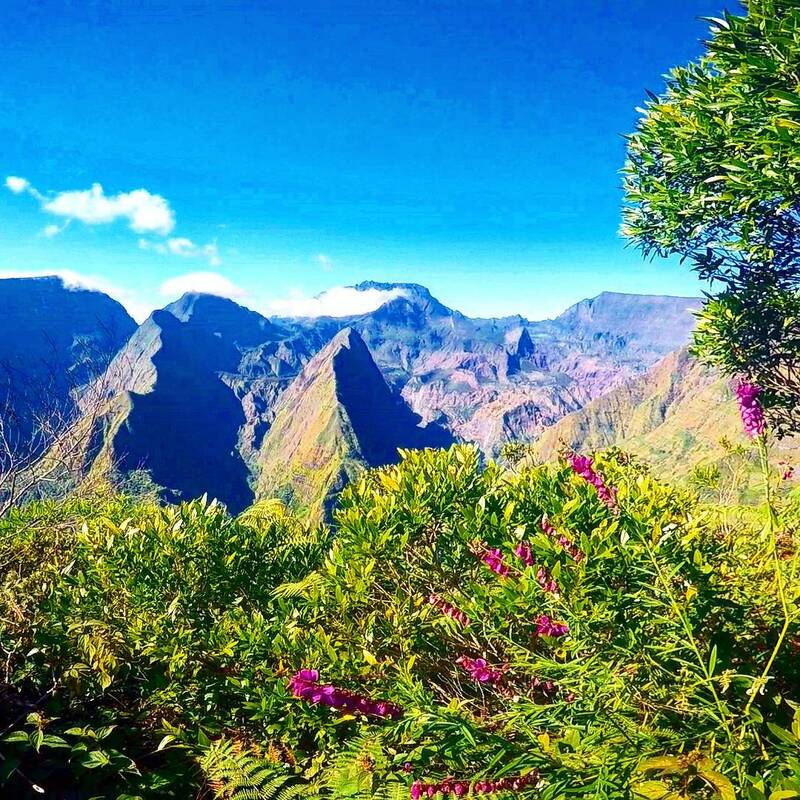 Le Piton des Neiges, culminating at 3069m above sea level, offers a rugged landscape with grandiose topography. The highest point of Reunion Island is surrounded by three vast eroded calderas, Mafate, Salazie and Cilaos, a true geological wonder with spectacular scenery and wonderful colors. What distinguishes the Cirque de Mafate is its inaccessibility, no roads leading to the amphitheater, just a good network of trails connecting the villages. No cars, no cities, no stress, but vertiginous mountains, deep ravines and dense forests. Hiking the majestic Piton de la Fournaise, the most active volcano in the world, offers fascinating lunar landscapes, along its ramparts, craters and volcanic peaks at 2632m altitude. A very active volcano that has eruptions almost permanently. It emits long lava flows that sometimes reach the sea. The eruption that began in 2006 and continued for years, having produced important changes at the top. 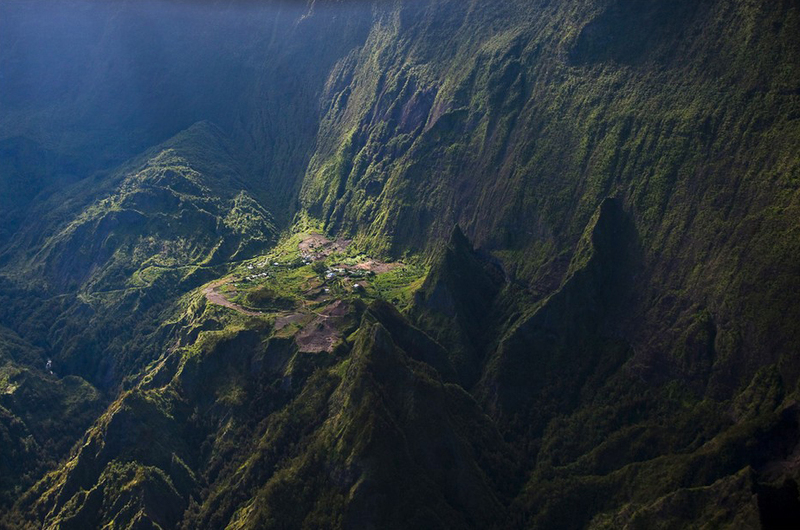 Peak of the Furnace is the most visited natural attraction in Reunion Island. There are several difficulties of tracks to discover the spectacular moonlike setting of the volcano. The French Hiking Federation has approved three long-distance hiking routes. The GRR1 (60kms) takes a road around the Piton des Neiges and crosses the three cirques. The GRR2 (130kms) crosses the island from north to south, from the coast to the highest peaks (Piton des Neiges and Piton de la Fournaise). The R3 (38kms) crosses the crater of Mafate. 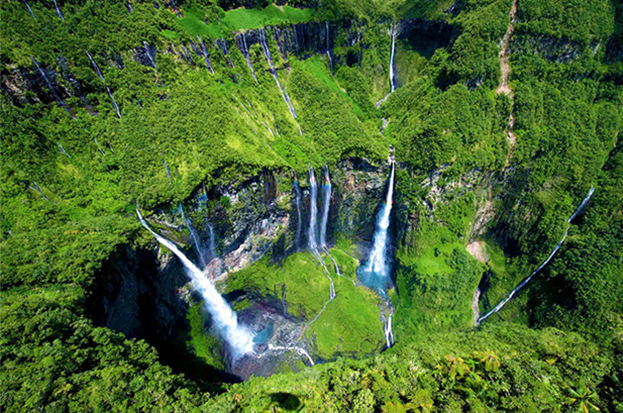 The calderas and volcanoes fall in the National Park of Reunion Island which consists 42% of the island’s total area. From half-hours of walking for families (the famous horseback trails) to long hiking trails, the island is a paradise for nature lovers. Do not miss the opportunity to meet the inhabitants of authentic villages scattered within the National Park. Enjoy a meal or even a night in one of the typical Reunion cottages, along the hiking trails, well deserved after a day of walking! Classified by UNESCO as a World Heritage Site for its Pitons, calderas and ramparts, Reunion Island has an exceptional treasure to protect. Almost half of the total area of the island is classified as a nature reserve. The most impressive landmarks of the island are the many dizzying heights of canyons and ravines covered with incredibly deep forests. Some of the highest waterfalls in the world are located in Reunion, possible phenomenon due to extreme cliffs and heavy rains. Le Trou de Fer (in the Belouve forest) is one of the most beautiful slot canyons in the world, adorned with countless waterfalls including the river Bras de Caverne, with falls of 725m. It can be visited by helicopter but the best is to climb it, you can do the descent, a truly canyonesque experience! Veil of the Bride (Cirque de Salazie) is another natural miracle of the Reunion National Park. Several falls descend from the wooded cliffs to pour into the same place creating a visual illusion of a veil of wedding dress, hence the name. The falls are in the heart of the Salazie caldera vegetation. The cascade blanche (white waterfall), Chaudron Falls, Niagara Waterfall are also famous sites with a height of 500 to 650 m.
Fleurs jaunes is an original waterfall, descending along a cliff in a narrow channel, reaching 300m high. It’s a legendary canyoning spot! Among the adrenaline sports, canyoning has found its place in Reunion. With many diverse sites, breathtaking waterfalls, incredible water slides and fun ziplines, this activity will delight lovers of vertical sensations! If you are looking for information, activity, accommodation and restaurants on the island discover our article 10 places to see in Reunion Island.